On Sunday, Schumacher came sixth in the sprint race, won by Luca Ghiotto. Italy's Ghiotto occupies top spot in the standings leading into the Azerbaijan Grand Prix on 28 April. 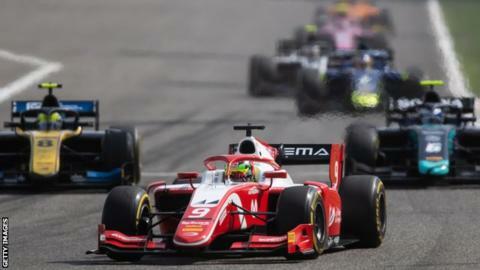 Schumacher Jr, who drives for Prema Racing, took eight points from the opening weekend and sits 29 points behind leader Ghiotto. The German began the second race on pole thanks to the reverse grid system for the top eight finishers of race one. His father is the only driver in history to win seven F1 titles, and also has the all-time record of 91 grand prix victories. His son will test with the Ferrari and Alfa Romeo F1 teams in Bahrain on Tuesday.